Urn found AD 1909 (NAT). Balfour suggests that a Celtic monastic settlement was founded here by St Brandon; some slight excavation was made in 1909. The supposed "cashel" is 2.25 acres in extent and is enclosed by a wall 1.5m to 2.1m thick. A gateway appears to have existed near the S extremity; inside the enclosure signs of plough ridges can be seen. 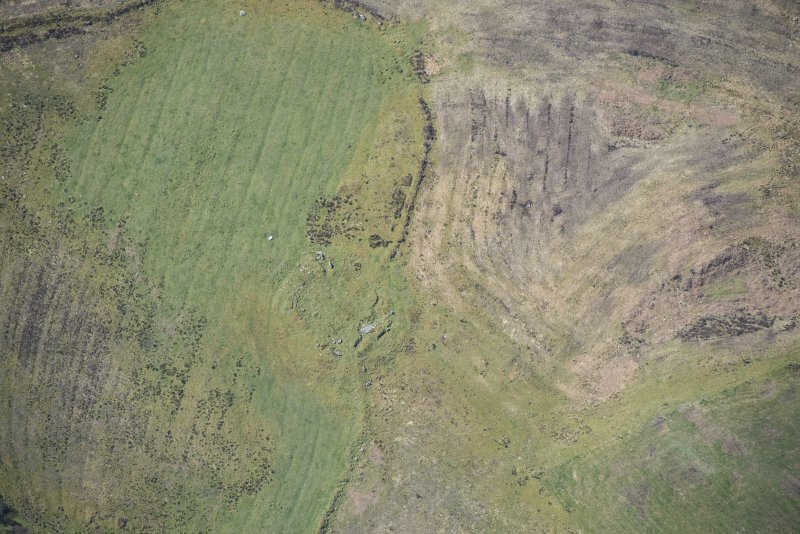 On the periphery of the enclosure in the N is a circular dun, around which the "cashel" walling curves. 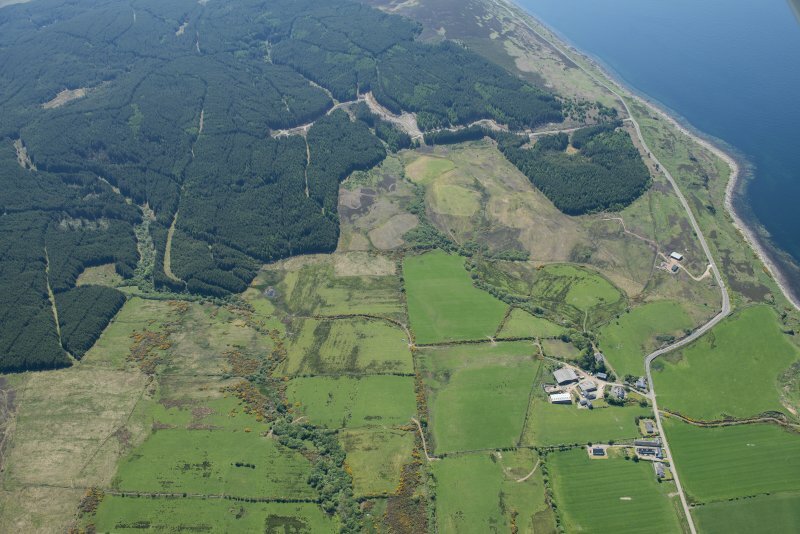 The dun itself is 16.8m in diameter, surrounded by a wall 3.7m to 4.6m thick within which there is at least one chamber. The entrance appears to have narrowed outwards as though checked for a door. 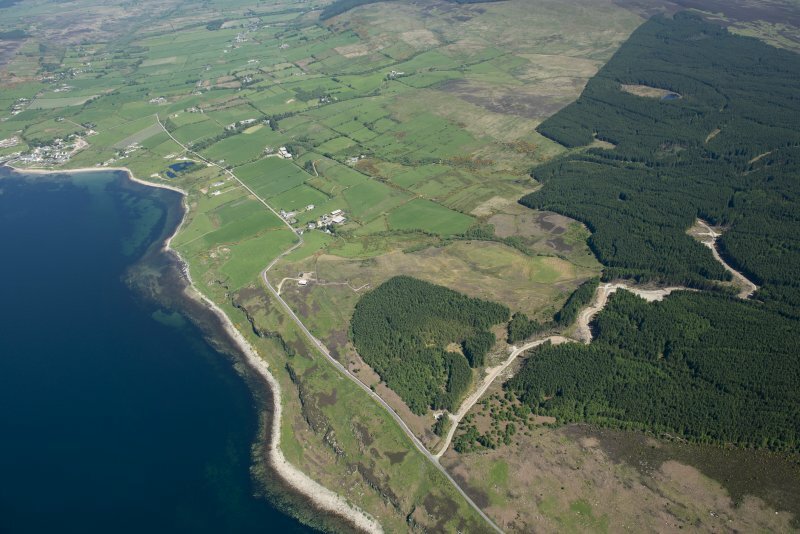 This is the only dun of its type in Arran; but the galleried dun of Kildonan (NR72NE 5) lies directly across Kilbrannan Sound, and there is another example at Dunburgidale (NS06NE 11). By analogy, a Romano-British date might be suggested though Kildonan was occupied intermittently into late medieval times. Earlier occupation at Kilpatrick was shown by the discovery (in 1909) of a short cist, containing a small, undecorated cinerary urn (inverted over bones, some only partly burned), beneath the wall of the dun. Several exceptionally long slabs are also noteworthy as possibly re-used at the time of construction of the dun. 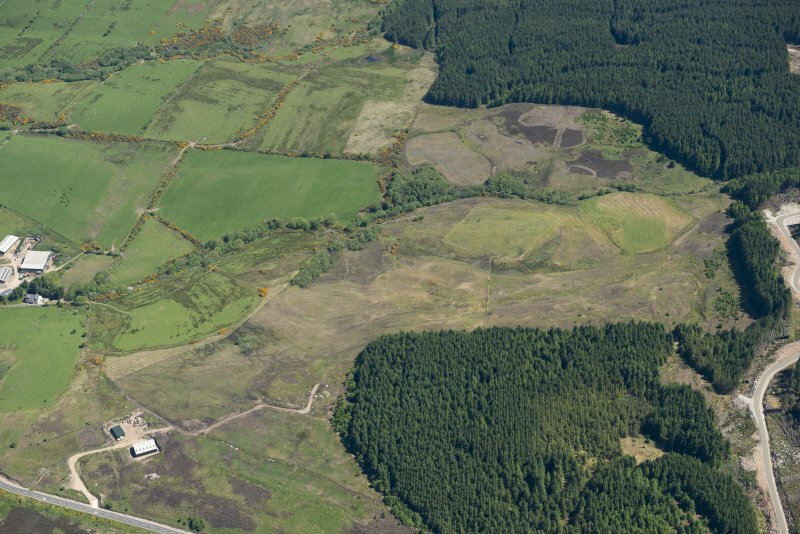 Outside the enclosure are four hut circles (NR92NW 11-13). 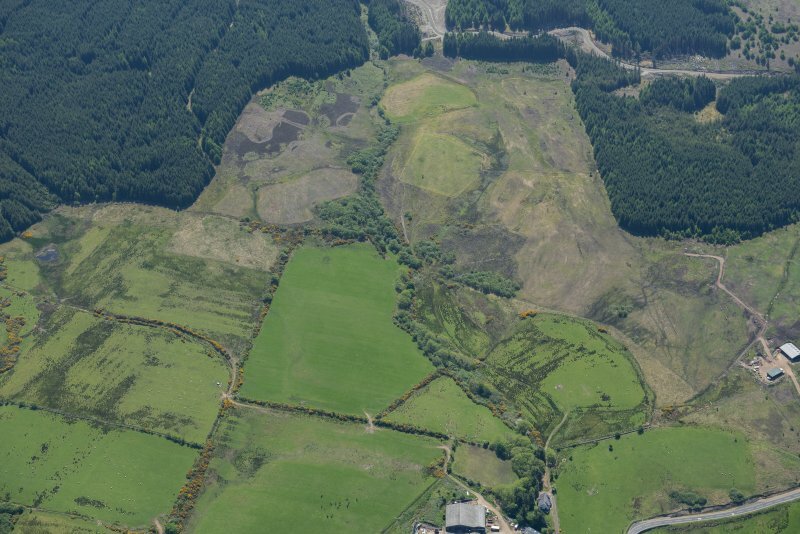 In association are alignments of boulders and an occasional clearance cairn indicating an ancient field pattern, now almost completely obliterated. Clearly the site has a long history, but the suggestion of a cashel is to be discounted in the light of more recent knowledge. J A Balfour 1910; J N G Ritchie 1973; R McLellan 1977. The activities of earlier excavators have made any meaningful survey of the present condition of this monument difficult. Nevertheless, two basic factors were noted: 1. It is a multi-phase monument and seems to incorporate an earlier large stone-built structure. 2. 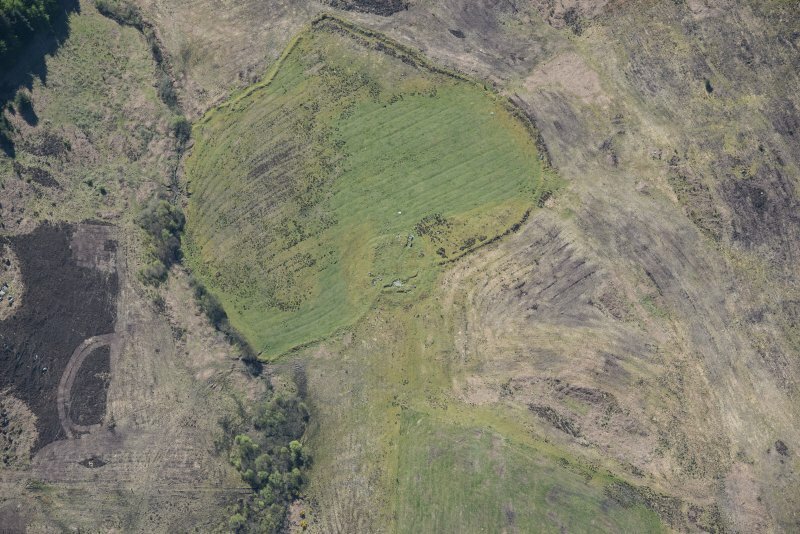 The construction, size and entrance detail of the "dun" are clearly linked with the structural details of the large hut circles elsewhere in the area; it may be viewed as simply a larger enclosure on the same lines - part of a dispersed farmstead comprising several large buildings. 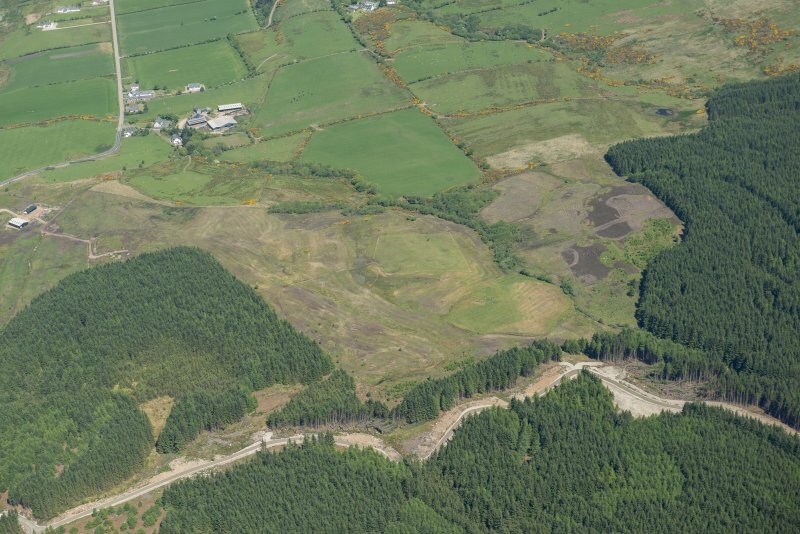 The "cashel" enclosure is simply part of a very much larger series of enclosures all linked with the farmstead complex and comprising the cleared land appended to the farm. The walls of this series of enclosures are well built with many substantial orthostats binding on an earth-and-boulder barrier. The impression is not of a simple boundary marker or clearance wall, but of a series of qui te substantial barriers intended for the control of stock. 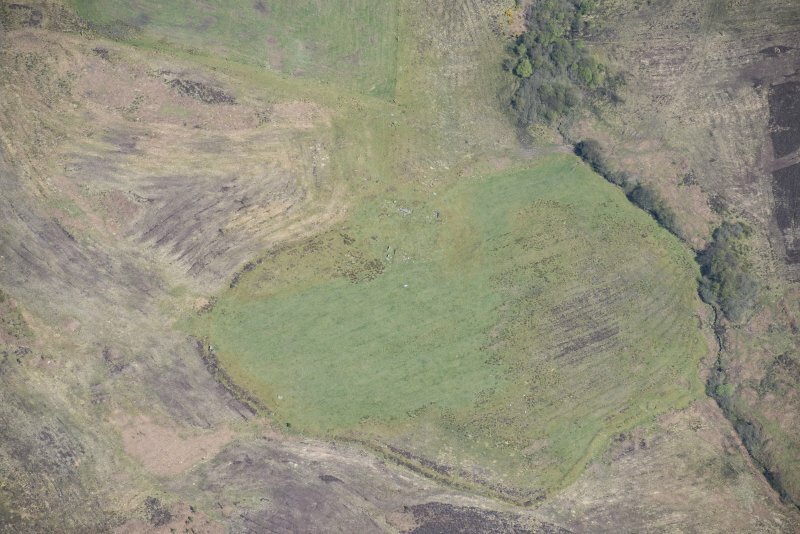 Plans show a fairly logical group of walls sealing off the lower part of Kilpatrick area from what may have been upland pasture. Within the area of this presumably prehistoric farm a series of cairns occupy often prominent positions. Whether these are clearance cairns, or evidence of burials, is impossible to tell without excavation. (See NR92NW 18). Information from Department of the Environment, Arran Field Survey MSS, 1976. 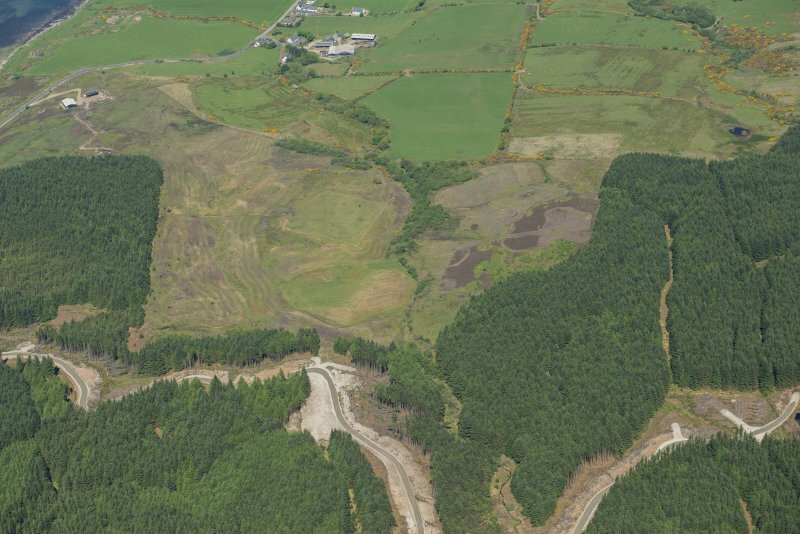 The large enclosure ('The Cashel') is well defined except on the east side where part has been eroded away by the burn. There is a small structure of earth and stone 3.0m wide in the south corner but this has been too extensively mutilated to identify. There are no internal or external field banks connected to the enclosure bank. The ridge and furrow is well preserved. Visited by OS (MJF), 24 October 1977. 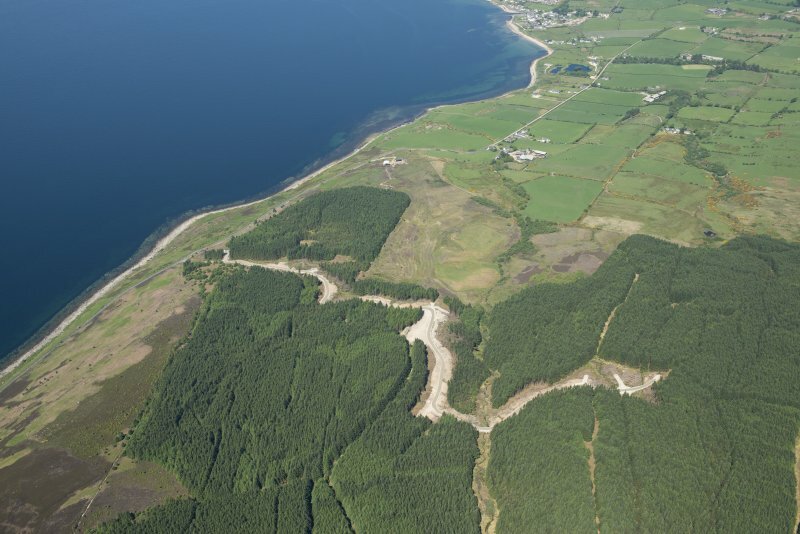 For many years this site was thought to be a 'cashel' (here used to described an Irish form of Early Christian monastery) and, despite excavation in 1909 by J A Balfour, this interpretation was accepted until comparatively recently. A re-analysis of the field remains, however, suggests that Balfour was mistaken, but there is still no general agreement as to the precise nature of the site. 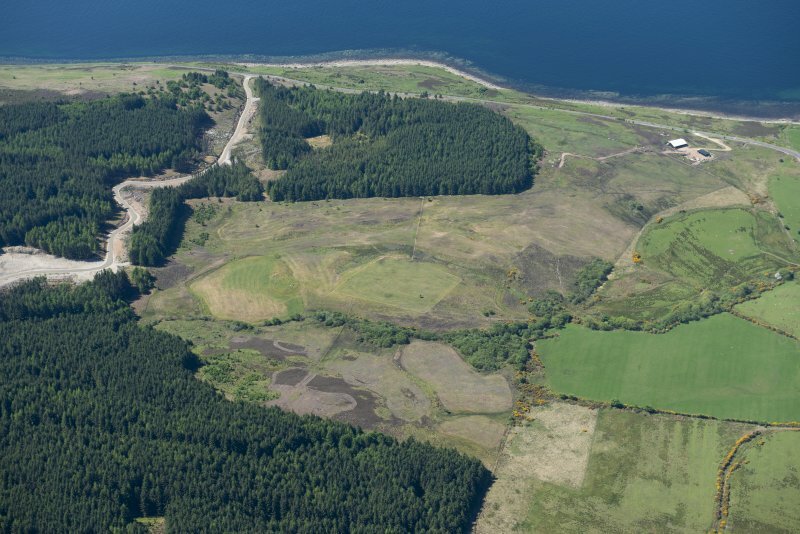 The remains comprise a large enclosure of a little under one hectare which is surrounded by an earthand-stone bank, and attached to its north side there is a smaller circular structure. Balfour interpreted the larger enclosure bank as the 'vallum' of the monastery, and the circular structure as the meeting hall of the monks; he also noted three 'monks cells' outside the enclosure to the west. 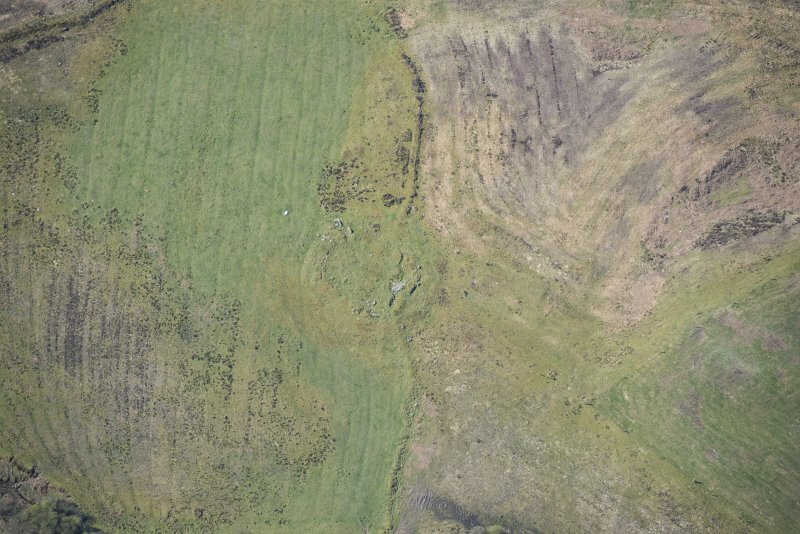 We can now be fairly certain that the 'vallum' is a comparatively recent field-bank with the rig-and-furrow strips it enclosed still visible, and that the three monk's cells to the west are the sites of prehistoric timber houses. The interpretation of the smaller circular structure remains in doubt; it is not monastic in origin, but there is not clear evidence of its function. 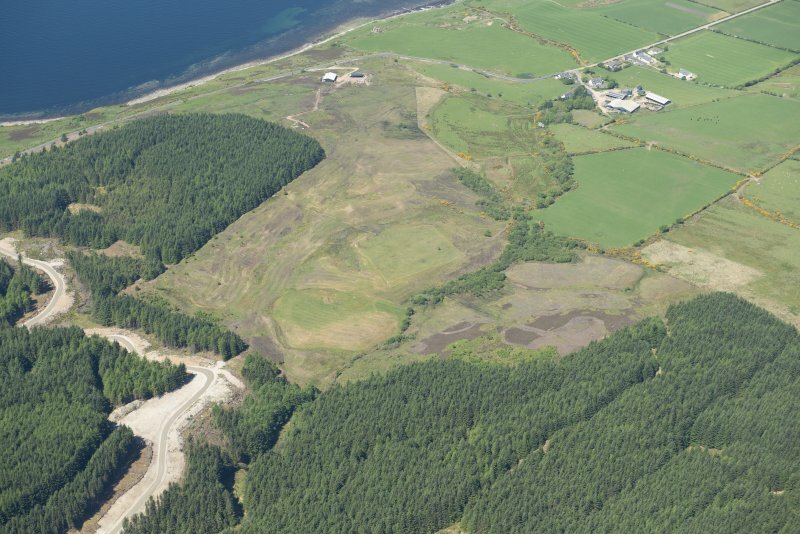 One suggestion is that it is an Iron Age dun,and its hilltop position would favour this, but the discovery during the 1909 excavations of a cist and Food Vessel in the wall, might point to a much earlier date and quite different function. 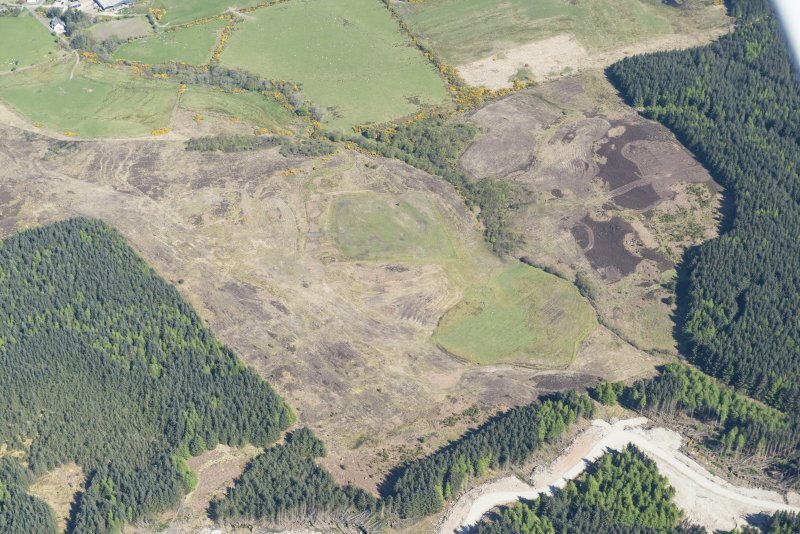 Its position would be in keeping with it being a chambered tomb or Bronze Age cairn, and the large slabs still visible in the interior, taken together with the so-called entrance-passage, might suggest that it could easily be a chambered cairn reused in the bronze age. Only excavation can solve the problem and it remains an interesting example of the changing nature and development of archaeological interpretation.